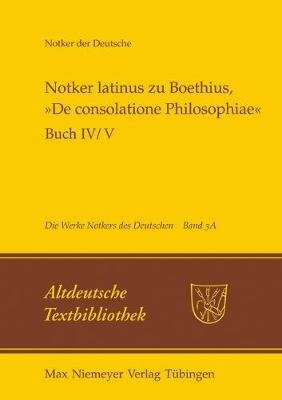 Notker III, Labeo or Notker Teutonicus translated a number of Latin school texts by Boethius into Late Old German, including the Consolatio Philosophiae (CPh), and wrote explanatory commentaries on them, mostly in his mother-tongue. He used numerous sources for his translation and exegesis. The first of the parallel volumes 1A, 2A and 3A to the volumes of text 1, 2 and 3 (published in our series Altdeutsche Textbibliothek) provides the fruits of many years of research into the sources in the form of a commentary (Notker latinus) on Notker 's version of the CPh. It is prefaced by a detailed index of abbreviations, siglia and literature followed by a comprehensive introduction presenting both the sources themselves and the principles underlying the commentary.